Just a rant, because my mind's literally quite blown by the response I got from twitter.. I have signed up to Orcon's new plan, 200GB. I put forward the order of new $99/200GB plan via Orcon's website on 23rd of April, and received an confirmation e-mail notifying me the date of change over. Originally 27th of April, I was rather impressed. It's probably quite popular, as it got pushed back to today. A refund for your current plan for the period 02/05/12 to the 23rd of the month - as you've prepaid this part already. A part month charge for your new Orcon Genius plan from 02/05/12 to the 23rd along with the base charge for the next period (as normal). Any data used until the 02/05/12 will fit within your current full data cap. 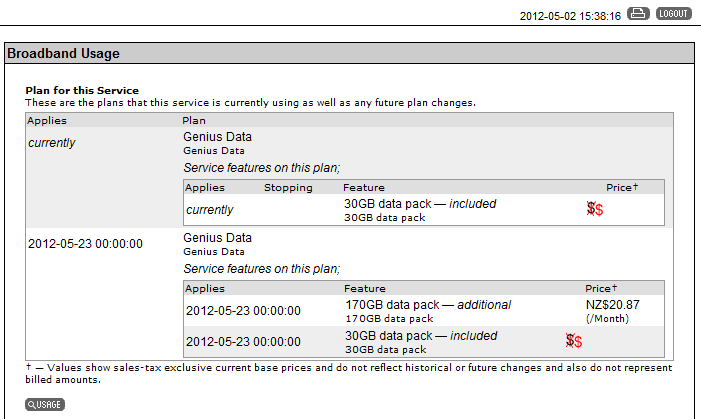 So going over this cap before 02/05/12 will incur casual data charges as normal. Any data used from 02/05/12 to the 23rd will fit within a partial month data cap, based on the portion of the month left from 02/05/12 to the 23rd. Apologies for the confusing bill in advance, we are in the process of streamlining it for the future. Per my understanding (unless my comprehension have failed me), it means that.. If I am to make my dollar work, then I should be using up my 55GB by today, and have 135GB till 23rd of May, but I am not the sort of folk, plus I do appreciate Orcon's new offer, so I have used around 15GBish. Now according to Orcon's twitter response, my plan for this month is actually 30GB, since the new plan starts 23rd of May, rather than immediately! This wasn't mentioned anywhere. From all the e-mails and communications I got from Orcon and from their website nowhere did it say the plan is effective from 23rd of May, when I order a new plan, and switchover date came, I expect to be on the new plan. So now I actually have half of data to use when compared with my old plan! Since I was on 55GB/31days and from now to 23rd of May I only have "partial month data cap based on the portion of the month left" great wording Orcon. For now I'd be imposing digital-austerity measure for my household.... But seriously Orcon, keep your customers updated. Especially when it defies common sense. Keep them updated will save a lot of trouble down the road. Orcon have just fixed it. Good thing I spotted this post, we had our plan changed over on Thursday. So thinking we had 1TB to use we have started to use up a fair bit of data. Should be an interesting battle with Orcon support to get this fixed. We contacted Orcon yesterday and they have logged a ticket with accounts. Looking at twitter this morning they are still telling people the new caps start on the 23rd, which is BS. If they had said anything about this on the site we would have waited until closer to the end of the month. Going from 105GB a month down to 30GB is pretty lame. My personal experience with Orcon has left a sour taste - the speeds were great however, I was guaranteed a downtime almost once every month. Also it was sleazy of them to include in the fine print for a 4 week termination notice. For that I will never return to them. I had a closer look at alliao's screenshots, looks like all they did is display his next months plan which still only comes into affect on the 23/05/12. Pretty disappointing if that is the case. I took screenshots way too quickly, I think they were still updating it at the time, as of now it's been corrected. I would suggest talking to them, and make it known that it's bad practise to downgrade people's data without some communication before hand. It's pretty obvious they have not think this through! No change yet, time for another call. plas: No change yet, time for another call.